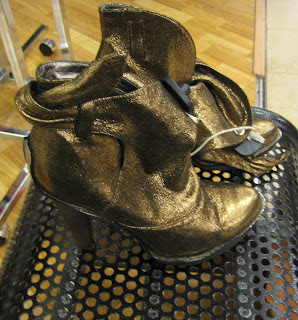 But if dog sweaters aren't your thing, perhaps shiny bronze-gold boots (oh DEER! $109) do it for you? Then there's the other clothing reductions on the 6th floor. 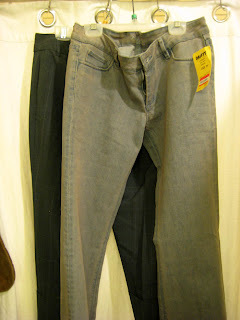 I got grey Radcliffe jeans now marked down to $15 because I practically sleep in my black ones. I also spotted an Alexander McQueen grey sweatshirt on the clearance rack, but it had a little hole on the front so I didn't try it on, but for $30 + I'm thinking of going back and mending it. Callixta leggings, Tracy Reese top, Radcliffe jeans. Those shoes are breaking my heart. Are the white ones Corso Comos? 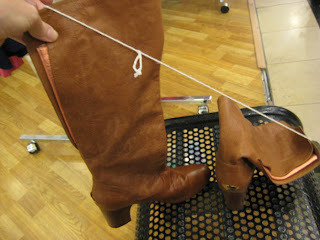 Yes, sorry, i didn't get the name of all the shoes, but they are Corso Comos! Want me to check for your size? you know, just to make up for the A+O's! I hate to say what everyone else has said but I love the shoes. Love those silver peep toes! love those leggings. they rock. Is that a sweater or a jacket? We may have to contact you separately about it! BTW MIss Fashion... we are in desperate need of a Madge/A-Rod update...? What's up? A story on ESPN piqued our interest and The Consort said, "Well ask the Fashion Herald, she's up to speed on all of that." hi there!! hmm.... i do love at first sight on those shoess!!! love em sooooo much!! visit back my blog, dear. you are invited. 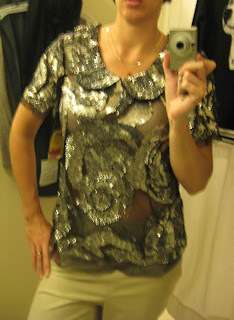 Hi there-love the Tracy Reese top on you!! Yes to doggy sweater and those bronzy shoes! And while I'm at it, I want those jeans too! I'm rather taken with the deer (er)boots! those white wedges look interesting . . .
A joyful "Yes!" to the gold shoes, and a hearty "No Thank You" to the dog top. Nope. sarah - I understand, the dalmation dog head is not everyone's speed. 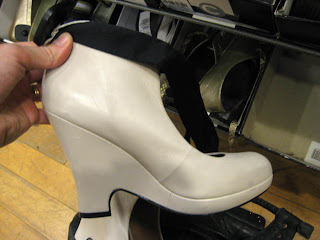 xs - the white wedge booties have a black satin wrap around strap - very interesting! make do - right? 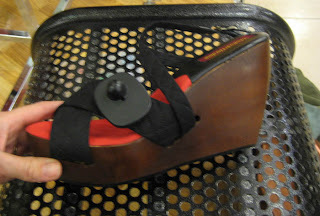 Daffy's has such an unusual shoe buy. grayburn - that crystal-like kryptonite Chaos bottle was the best, I miss it. sharon - daffy's gets a lot of cute Tracy Reese. Putri - going to visit! 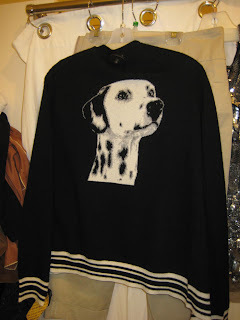 TP - it's a sweater - contact me, there are several there and I know yr sister in law may be tempted?! and i've been distracted by the Joe Torre tell-all re: ARod. Oddly, the press has been quiet about Madge and Rod. Weird. Savvy - aren't they fun? Love them. Siljes - I love them, and they are so you. 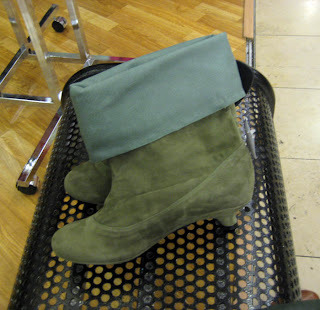 la belette - always they have the interesting shoes! kira - they're fun, right? wendy - wish i could get them all. 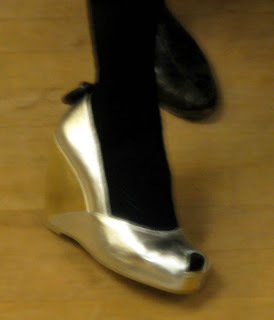 Silver shoes are my Kryptonite. Must...get....them.